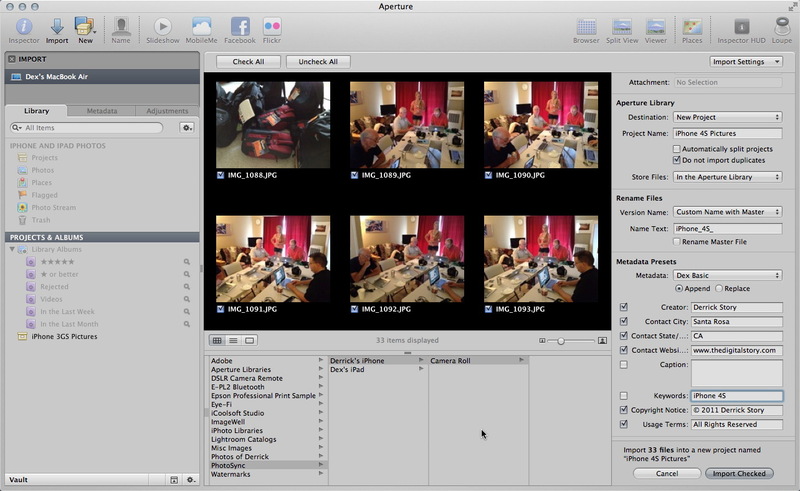 If you connect your iPhone to your mac you can import directly into Aperture, not sure why dumping photos into a folder adds value? Bill, the added value is that you don't have to make the physical connection. Both the PhotoSync and Photo Stream workflows eliminate the need for that extra cable when dealing with importing images from the iPhone. Yes, the wireless connectivity to all of my devices, including my Mac, is precisely the issue. The entire process only takes a few seconds. Plus, the photos can go to other devices, such as my iPad without the hassle of plugging things in. Thanks Derek. Don't forget that PhotoSync works with Windows PC's as well. Thanks Derrick. PhotoSync also works with Windows PC's as well. Since Photo Stream doesn't sync videos, PhotoSync seems to be a better all around answer for getting those off the phone. Thanks, Derrick. I can't believe A3/iTunes/iPhone doesn't do automatic sync of photos taken on the iPhone. This app fills the gap. Is there a way to designate a specific folder to sync to? It seems like the app automatically chooses a folder.